The Penguins' injury woes continued this weekend when Marc-Andre Fleury was diagnosed with a concussion., but the team's next man up mentality continued to prevail. Pittsburgh enjoyed a balanced scoring effort that saw 12 players register a point, Matt Murray stopped 28 of the 30 shots on goal he faced, and the Penguins beat the Philadelphia Flyers 6-2 to finish off their home schedule in style. Eric Fehr scored a couple of goals, including an empty netter in the final minute, while also adding goals were Sidney Crosby, Beau Bennett, Patric Hornqvist, and Carl Hagelin. The Pens were buzzing early and nearly scored on their first shift after some nifty passing opened up Patric Hornqvist in front, but Steve Mason got his right pad on the shot and Pittsburgh wasn't able to convert off the rebound. Philadelphia would get a power play opportunity minutes into the game when Ian Cole took a needless interference penalty a day after taking several questionable penalties against the Islanders, but the Penguins would do a good job of keeping the shot attempts to the perimeter, and Matt Murray was able to stop the redirections in front, and the Pens killed off the penalty. The play would return to even strength, and the Penguins would continue to drive play into the Philadelphia zone, much like they did in their previous meeting with the Flyers. Tom Kuhnhackl had a great defensive shift midway through the period, making a couple key blocks to prevent shots from getting through the Murray. It would seem to be a matter of time before the Penguins were able to break the game open, and the turning point was Wayne Simmonds taking a hooking penalty against Sidney Crosby, and it was Crosby who would open the scoring when he backhanded a shot past Mason on the crease shortly into the ensuing power play. Just over a minute later, the Penguins struck again to double the lead. Conor Sheary did a great job protecting the puck driving the slot before sliding a pass across the crease that Beau Bennett was able to put into the empty net to give Pittsburgh the quick 2-0 lead. 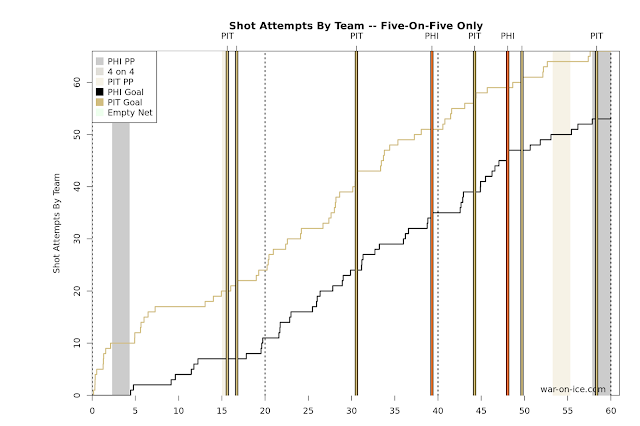 It was a lead the Penguins would take into the locker room for the first intermission, and they'd continue to drive possession despite the obvious score effects, and the commitment to trying to increase the lead paid off midway through the 2nd period. Patric Hornqvist stole the puck near the half boards and carried it into the center slot. His initial shot was blocked, but he collected the rebound and wristed it behind Mason to put the Pens ahead 3-0. As the period wore on, the Flyers got more and more pressure in the Pittsburgh zone, and they increased the physicality trying to knock the Penguins off their game too. While the Pens responded well, it was a perfectly placed shot by Wayne Simmonds off the rush that cut the lead to 3-1 in the final minute of the period. Simmonds shot the puck through Ben Lovejoy's legs, off the crossbar, off the post, and into the net to give the Flyers some momentum heading into the second intermission. Each team would be looking for the next goal starting the 3rd period, and it would be the Penguins getting it just over 4 minutes in. Nick Bonino would tip a Letang shot from the right half wall, and the redirection would go across the crease, where a diving Carl Hagelin was able to poke the puck into the net on a tremendous individual effort, pushing the lead to 4-1. Philadelphia would be able to answer minutes later though, as Jakub Voracek was able to outbattle Brian Dumoulin on the crease to tip a Shayne Gostisbehere shot past Murray's glove arm to cut the lead back to two goals. But it wouldn't take the Pens long to reestablish the three goal lead. Tom Kuhnhackl crushed Andrew MacDonald along the left halfboards, freeing the puck for Matt Cullen to grab the puck and skate in on the net. Cullen made a great spinning pass around Gostisbehere to feed Eric Fehr, who slapped the puck past Mason to give the Pens the 5-2 lead. The officials all but put away their whistles in this game despite the increasingly chippy gameplay, but the Penguins would return to the power play with under 7 minutes remaining in the period when Gostisbehere held Hornqvist as he came around the Flyers net, although they wouldn't be able to convert. The Flyers would think they scored to cut the deficit to two with nearly 4 minutes left on the clock, but the refs would wave off the goal after ruling Simmonds hit it in with a high stick. Nick Bonino would be called for hooking Nick Cousins with two minutes remaining, but after the Flyers pulled Mason for the extra attacker it would be Fehr icing things with an empty net goal. The Penguins dominated the Flyers in possession the last time the two teams met, and nothing changed in this game as Pittsburgh had a score-adjusted 58.8CF%. Matt Murray was tested in this one much more than he was yesterday against the Islanders, but he's responded to being the number one netminder in Fleury's absence by stopping 52 of 54 shots he faced. The Penguins have now hit 100 points on the season and sit 5 points ahead of the Rangers for second place in the Metro. The magic number for clinching 2nd place is down to 4, and Pittsburgh will finish off their regular season with three road games, traveling next to Ottawa to face the Senators on Tuesday night.